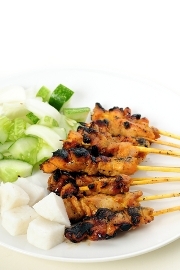 Sate Manis is the famous Indonesian dish. It’s known in the whole world. It’s not really strange why this dish is such a favorite because of the taste. It’s so delicious and has certainly perfect taste for any kind of occasions. Make a smooth paste of onion, garlic, coriander, candlenuts, and aromatic ginger. Set aside. Cube the meat, 1x2x2 ½ cm. Mix the meat with the paste until everything is well coated with the hand. Add tamarind, salt and sugar. Mix again. Add Kaffir lime leaves, but before you add, broke the leaves with the hands until you smelt the fragrance of the leaves. Add it. Let them overnight so that the spice would be completely soak in. Skewer the meat about 3-4 per skewer. Grill the sate, with the charcoal barbecue instead of gas. The taste would be different if you use gas barbecue. 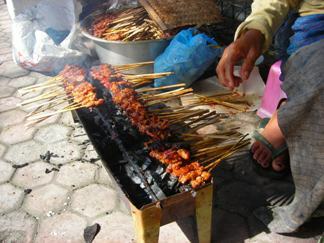 Dipping it in the sauce when the sate is half done, and grill it again until the sate completely ready. Charcoal barbecue, easy to use and cheap to obtain. Use elongated form so that the skewer doesn’t burn or completely break down. Warning: Don’t use too big fire, keep it low, or else your meat would be burned too fast but the inside is not completely done.